The Daily Mail offers a piece on the death of actor Abe Vigoda. Character actor Abe Vigoda, whose leathery, sunken-eyed face made him ideal for playing the over-the-hill detective Phil Fish in the 1970s TV series Barney Miller and the doomed Mafia soldier in The Godfather, died on Tuesday at age 94. Vigoda's daughter, Carol Vigoda Fuchs, told The Associated Press that Vigoda died on Tuesday morning in his sleep at Fuchs' home in Woodland Park, New Jersey. The cause of death was old age. 'This man was never sick,' Fuchs said. 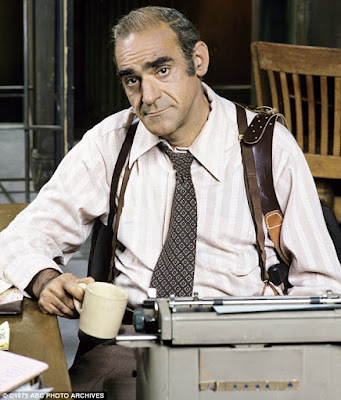 Vigoda worked in relative obscurity as a supporting actor in the New York theater and in television until Francis Ford Coppola cast him in the 1972 Oscar-winning The Godfather. Vigoda played Sal Tessio, an old friend of Vito Corleone's (Marlon Brando) who hopes to take over the family after Vito's death by killing his son Michael Corleone (Al Pacino). But Michael anticipates that Sal's suggestion for a 'peace summit' among crime families is a setup and the escorts Sal thought were taking him to the meeting turn out to be his executioners.